Kerala and Tamil Nadu welcomed the arrival of the south-west monsoon on June 8, as rains lashed these two states, along with the extreme southern tip of Karnataka and the Union Territories of Puducherry and Lakshadweep after a week’s delay. Delay in the arrival of the monsoon has occurred in the past and it is not something to worry about. In 2003, the monsoon had reached Kerala on June 8 whereas in 1997 it reached the state June 9. The last significant movement this year’s monsoon made was on May 20 when it arrived in the Andaman and Nicobar Islands. After that, there was a long hiatus which ended on June 7 with the rains advancing onto Sri Lanka, the Arabian Sea and the Bay of Bengal, according to the India Meteorological Department. As on June 9 afternoon, monsoon has further advanced into Karnataka, Andhra Pradesh, the Arabian Sea and the Bay of Bengal. In the wake of the monsoon’s arrival, heavy rainfall was recorded in parts of Kerala on June 7-8 which included 150.8 mm in Alappuzha, 125 mm in Punalur, 72.6 mm in Kannur, 71.8 mm in Trivandrum and 59 mm in Kochi. On the very first day of the monsoon, moderate to heavy showers continued in Kerala whereas light to moderate rains occurred in parts of Tamil Nadu. The progress of the monsoon is not proportionate as the Bay of Bengal branch of the monsoon is very sluggish. Normally, by June 8, it should have reached east Indian states like Bihar and West Bengal, but it is still stuck in southern Myanmar. There has been a mixed impact of this delay in India with some states recording excess rainfall. Though the monsoon arrived in the mainland of India on June 8, the season officially commenced from June 1. Despite a week’s delay in the onset of the monsoon, Kerala has received normal rainfall whereas Tamil Nadu and Puducherry have received excess rainfall between June 1 and 7. The delay in monsoon’s onset has not affected the rainfall in Karnataka, Andhra Pradesh and Telangana. 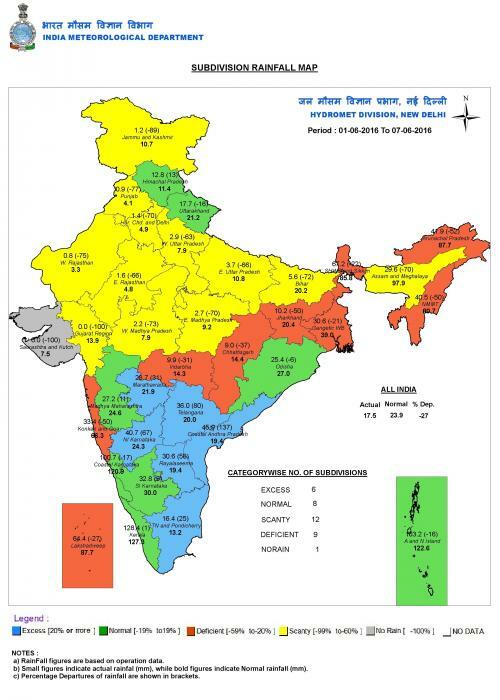 These states have already received normal or excess rainfall just because of strong pre-monsoon thunderstorms. In Maharashtra, Marathwada and central Maharashtra were reeling under intense drought conditions. But in these two regions, excess and normal rainfall has been recorded respectively. Latur district, which supposedly is the worst-hit place, in Marathwada, has also received excess rainfall which is 42 per cent more than the average rainfall during June 1-8. This is really intriguing and shows the power of thunderstorms. In a month like June, atmospheric stability decreases as the monsoon approaches. The incursion of moisture from the Arabian Sea and daytime heating lead to the formation of strong thunderstorms, thus bringing much rainfall. Thus, the extended pre-monsoon season this time can bring good rains in some states of India. But last year, the position was better. Rainfall departure in India (June 1-8) is -19 per cent unlike +4 per cent last year when a combination of western disturbances in north India, pre-monsoon showers in the south and monsoon in the Andaman and Nicobar Islands had brought good rainfall. The present momentum of the monsoon seems to be a bit less than it normally should be. This is because of the absence of any low pressure system in the Arabian Sea or the Bay of Bengal, which are responsible for pulling the monsoon winds like we saw at the time of monsoon’s onset in the Andaman and Nicobar Islands. The momentum of the monsoon needs to be high for it to continue to bring in good rainfall in areas where it has already arrived and for its rapid progress in the areas where it is yet to arrive. As a result of this weak momentum, decrease in rainfall in Kerala, Tamil Nadu, Karnataka and Andhra Pradesh is anticipated in the next few days. Unlike the monsoon’s onset in Kerala, there is not any specific set of criteria for declaration of monsoon’s arrival over other parts of India. 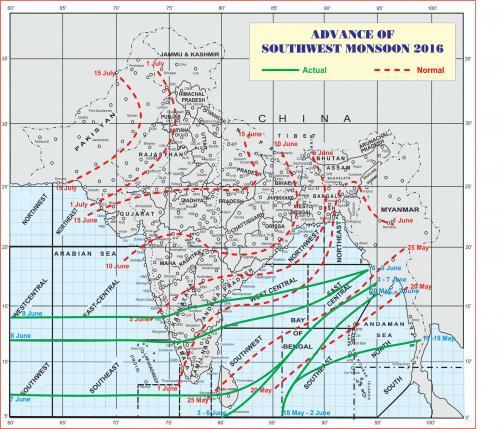 Hence, it is up to the IMD to declare the advancement of the monsoon. Generally, rainfall, speed and direction of the winds in various levels of the troposphere (lowest part of the atmosphere where weather systems exist), cloud cover, moisture and so on are taken into consideration while declaring the progress of the monsoon. An important feature of the monsoon is the presence of the deep layer of westerly or south-westerly winds from the surface levels to an altitude of around 15,000 feet in the sky. Deep layer of westerly or south-westerly winds means winds in all the layers of troposphere between surface and an altitude of 15,000 feet need to be from western or a south-western direction. As per weather models, deep layered westerly/south-westerly winds are present and rainfall is expected in the coming days over southern and central Karnataka and southern Andhra Pradesh. That is why the IMD declared the progress of the monsoon in these areas on June 9. Also, the presence of a weak off-shore trough near the Karnataka coast will help in the progress of the monsoon along coastal Karnataka, Goa and possibly up to Konkan of Maharashtra by June 12. Off-shore trough is an elongated low pressure region which runs parallel to the west coast of India. It is a prominent feature of the monsoon circulation and when stronger in strength helps in bringing rainfall in the coastal areas, including cities like Mumbai. Meanwhile, in the north-eastern states, the monsoon should start progressing after June 13. If we believe the present model runs including that of the IMD, monsoon does not seem to be making any progress after this stage for the next few days. This can be asserted from the fact that meteograms (type of weather maps showing location of specific weather conditions) of several cities such as Hyderabad, Vijaywada, Pune, Mumbai and Nagpur do not show proper westerly/south-westerly monsoon winds at least till June 15. Besides this, sporadic rainfall is estimated in these areas, and hence, conditions do not seem to be favourable for the monsoon’s further progress in Telangana, northern Andhra Pradesh and most of Maharashtra at least till June 15. As per the extended range forecast issued by the Indian Institute of Tropical Meteorology on June 6, monsoon’s arrival is expected to happen around or after June 20 in central India (Maharashtra, Madhya Pradesh, Gujarat, Chattisgarh). Farmers in these states, especially Vidarbha and Marathwada regions of Maharashtra must not hurry in sowing. If all goes as per the forecast, sowing activity will probably pick up after June 20 in these areas. It is too early to forecast specific dates, but the monsoon’s arrival in the plains of north India will happen after June 20 only. Over the next few days, intermittent pre-monsoon thunderstorms will continue to occur in Maharashtra, Telangana, Andhra Pradesh and parts of east India such as Odisha and West Bengal. High temperatures are back in the plains of north India. But a change of weather is expected due to an approaching western disturbance which will bring dust storms and thunderstorms. Places in Punjab, Haryana, Chandigarh, National Capital Region (NCR), Delhi, eastern Rajasthan and Uttar Pradesh (especially areas adjoining NCR) will get thundershowers between June 10 and 13. As a result, maximum temperatures will decrease by a couple of degrees and rainfall will bring some relief from the heat.